Distribution: Thirteen species within five genera occur in the Galapagos Islands. They all evolved from a single species from the Pacific coast of South America. 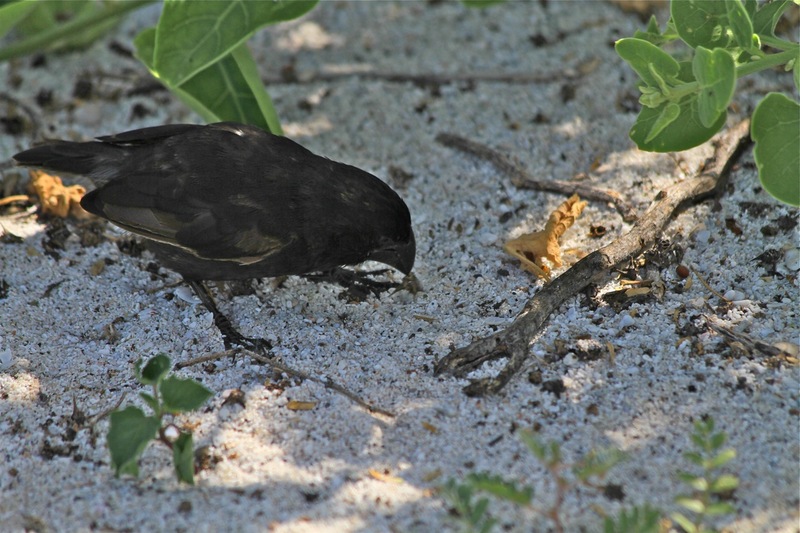 Appearance: All of Darwin’s Finches are sparrow sized and similar in appearance with grey black or olive feathers. They have short rounded wings and a rounded tail that often appears cocked to one side. Most male finches are a solid black in color while females are a drab greyish color. Exceptions include the vegetarian and tree finch where the males have a black head, neck and upper breast. Warbler, woodpecker and mangrove finch have more olive color. Evolution and Diet: Finches adapted to their habitat and the size and shape of their bills reflect their specializations. Vegetarian finch and ground finch all have crushing bills while tree finch have a grasping bill and cactus finch, warbler finch and woodpecker finch have probing bills. The finch vary by what they eat some eating seeds and others insects. 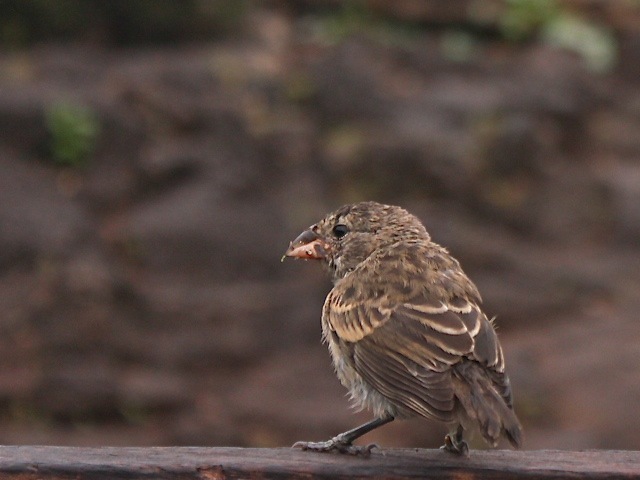 The ground finch eat ticks they remove with their crushing beaks from Galapagos Tortoises, and Galapagos Iguanas and kick eggs into rocks to feed upon their contents. On Isla Wolf the sharp beaked ground finch is known as the “vampire finch” as it jumps on the backs of masked boobies and red-footed boobies pecking at their flesh and feeding on their blood. Woodpecker and mangrove finches use small twigs and cactus spines as tools to extract larva stored in dead tree branches. 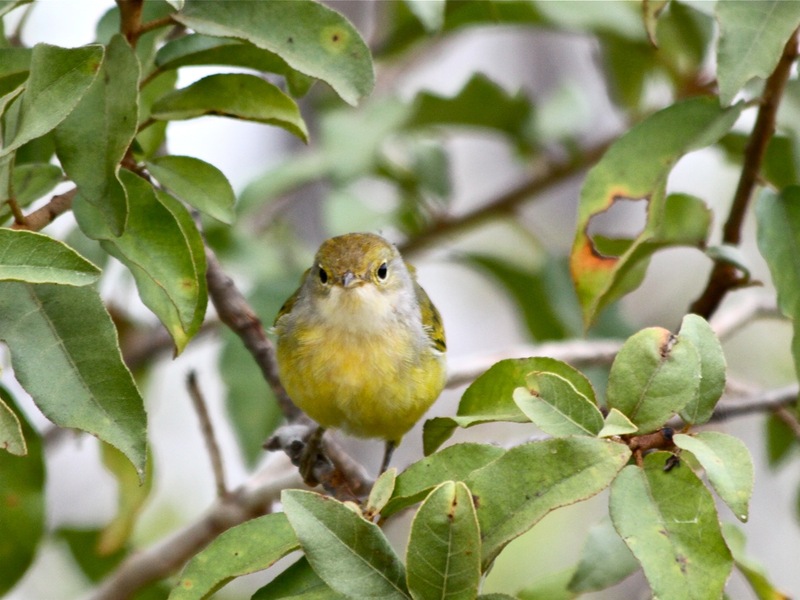 Remarks: Today studies show evolution occurring rapidly over recent bird generations with better suited populations living to reproduce more commonly. Over time these small changs can create a new species. A good reference on the complexities of the Galápagos finches is: Galápagos – A Natural History by John Kricher 2006 by Princeton University press. Distribution: Alaska to Canada to Peru to the Galapagos Islands. Habitat: On most Islands it is present from shore to mountain top. Appearance: Male is usually brighter than the female and has chestnut-brown markings on the crown and breast. Immature are much greyer (often olive yellow) and can be confused with the warbler finch which has no yellow in its plumage.